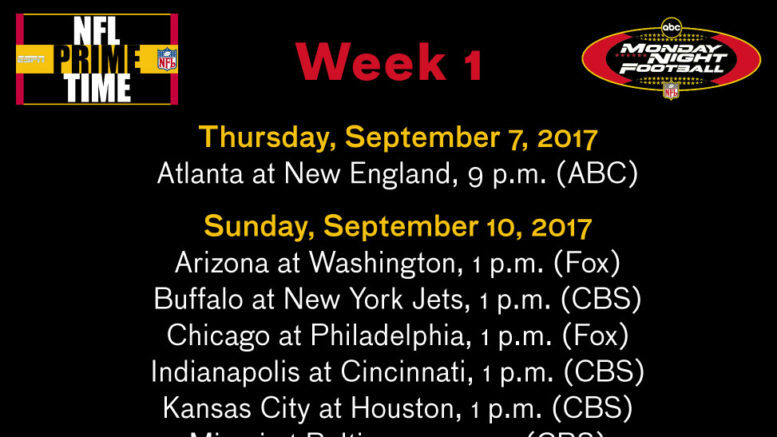 DraftAmerica presents an exclusive look at the 2017 NFL schedule... the way it should be, at least. This is the basic master version of my schedule. Click HERE for an enhanced viewing experience of the master schedule. For individual, color-coded, team-by-team schedules, click HERE to view to via Google Docs. Football fans don’t have very much to get excited about between early February and September other than the NFL Draft. After a while, the buzz of free agency, minicamps, OTAs, and even preseason fades and makes us revert to the same whiny people we were when the Super Bowl dust settled. For me, the highlight of every offseason used to be — until 2010, anyway — the revelation of the master NFL schedule, which would happen some time in April. Under former NFL commissioner Paul Tagliabue and the old deal that the television networks had with the league, the schedule was often a work of art. Sundays went this way: watch pregame coverage for two hours, get wrapped up in the early (1 p.m.) games, and double down with the 4 p.m. games. Then, take a brief bathroom/food/move-around-ever-so-slightly break before recapping the day’s action with Chris Berman and Tom Jackson on NFL PrimeTime. Afterwards, cap off your all-day affair with ESPN Sunday Night Football, broadcast by the delightful trio of Mike Patrick, Joe Theismann, and Paul McGuire. If you can, have a semi-productive Monday before the marquee event — Monday Night Football on ABC with Al Michaels and John Madden. And then, of course, go back to real life before lathering, rinsing, and repeating six days later. That all began to change, of course, when the TV package was reformatted upon Roger Goodell becoming head honcho in 2006. Sunday Night Football moved to NBC and became the premier game, while Monday Night Football was relegated to second-class citizen on ESPN. Thanksgiving no longer left you an evening to recover from the Lions and Cowboys games, because it was the beginning of an eight-week package of Thursday Night Football games on NFL Network, which included a couple of Saturday night affairs. Those Saturday games unfortunately replaced another gem of the old schedule — Saturday afternoon games. And in 2010, my favorite week of the schedule, Week 17, became permanently restricted to divisional contests, robbing us of wonderfully unpredictable matchups and leaving us with the Steelers beating up on the Browns (every year except for one) and the Patriots bullying little brothers Buffalo and Miami. The only thing that stayed the same (mostly, save for seven “cross-flex” games) is that CBS gets games in which the road team plays in the AFC, and Fox gets games where an NFC team is the visitor. No, I do not care for cross-flexing. It’s important to note that the four individuals who actually area responsible for putting the NFL schedule together pick one master schedule from tens of thousands of computer-generated drafts. This schedule is completely man-made, the way that Val Pinchbeck used to do it. So what is one forlorn fan to do with zero control over the situation? Dream, of course. And so dream I did, by creating my own version of the 2017 NFL schedule — the way it used to be, upholding the Tagliabue-era legacy. I decided to use some spare time to put my mathematical and puzzle-solving skills to use and found that, while at times incredibly maddening, this was also a lot of fun to try and jump through obstacles that the scheduling formula throws at you. You have no idea how incredibly legitimate and realistic this schedule is, so I’m going to break down everything I had to work around to make sure that no teams would be left bitter and unhappy (except for maybe the Houston Texans). This wasn’t simply me taking a bunch of games and throwing them at the wall to see what would stick. This was anything but amateur hour. Let me take you on this journey with me and how I created the crown jewel of the NFL offseason — the way it was supposed to be. More football = better football? Not a chance. I personally abhor Thursday Night Football, unless it’s the season opener or Thanksgiving. Football being played primarily on Sunday and Monday (with the exception of those aforementioned late-season Saturday contests) made the game special and didn’t water down the product. It made Sunday a truly special day, and also meant that prime-time games were generally reserved for teams that deserved it based on either their previous year’s performance or their incredibly aggressive offseason. Because of that, I also decided to scrap the flex scheduling, even though it is supposed to guarantee you get a meaningful matchup every week. I completely understand that more meaning means more ratings, which means more money, and the conversation ends there. But it is completely okay to commit to a game and stick with it, rather than play into the 2017 A.D.D. culture we live in where if something better is out there, we just drop what we’re doing and go for it. I tend to believe as much in this simple fact: if football is on television, people will watch. So, with all of that said, the only Thursday games my schedule features are the Thursday night kickoff opener and Thanksgiving (only the Lions and Cowboys). By now, if you’re a moderately astute fan of the Giants, Jets, 49ers, or Raiders, you know that the New York and Bay Area teams never play at the same time, nor on the same TV network on the same day. Now, we can add L.A. into the mix (presumably, anyway). With the Chargers and Rams now officially sharing the same television market, it’s safe to assume that the same restrictions will be placed on the two teams, especially considering that they will share a stadium in a couple of years. I was flawless keeping the New York and Bay Area teams apart, and only came across two weeks where I was unable to avoid having the Bolts and Rams playing at the same time (but at least not on the same network). I would imagine that this is the most difficult part of the schedule-makers’ task, and it’s become even trickier with the Chargers’ move to L.A. I noticed a pattern through the 2002-2005 seasons – there would always be 35 prime-time games, meaning that CBS or Fox had to lose one additional game to ESPN or ABC. So for fairness’ sake, it would alternate, and since 2005 had Fox losing an extra game, I figured it was CBS’ turn this time around. As a result, CBS would get one additional “doubleheader” (the 4:15 slot instead of the 4:05 slot), but neither network generally gets doubleheaders more than two weeks in a row. Thanksgiving, which has since gone to the dogs thanks to cross-flexing, would be lined up for the Lions to play on Fox and the Cowboys to play on CBS. That leaves Dallas with two possible Thanksgiving opponents, with the Chiefs being the more logical choice over the Chargers. Generally, there shouldn’t be more than five or six teams playing three straight games at home during the season, and fewer that have to endure a three-game roadtrip. Doing my best to stagger long plane rides, especially for East Coast teams heading west, I still didn’t do the Redskins or Texans any favors. Washington has two trips to Los Angeles and a trip to Seattle, and teams generally don’t like back-to-back games on the opposite coast because they have to decide whether to spend the entire week out west. The Texans were given one of only two three-game road trips, but it’s a tough one, with a trip to Seattle sandwiched between divisional road games. At least it’s not a full cross-country trip to Seattle. Meanwhile, at most you would have about four or five teams that begin or end the season with two straight home or road games. My slate had four teams apiece to start the year, and five apiece to end it. Oh yeah, and there won’t be any London or Mexico games in this dreamland schedule. I stayed true to 2002-2005 form with the bye weeks, when the league always utilized Weeks 3-10 for the bye weeks, giving four teams each an open date during those eight weeks. Early apologies to the Bills, Bears, Chiefs, and Steelers for their Week 3 bye weeks. Prime-time games are tricky. As I’m treating Monday Night Football as the top ticket, the best teams would receive their old limit of three games on MNF and four prime-time games in total. One pattern the NFL had was almost always alternating home and road for a team’s first two MNF games. A team can’t play thrice on MNF without at least one home or road game (the 2005 Falcons were a rare exception with three MNF home games, though they did play a Sunday night affair on the road). I gave seven teams four prime-time games, with only the Broncos being a non-playoff team from 2016. Some of the best Week 17’s that I can remember involved non-division games, so no matter how many virtual “play-in” games the all-division format gives us, I’m not sold. So my Week 17 featured only seven divisional games, because again, it’s okay to leave things to chance. One of the great hypocrisies the NFL does not tell the casual fan is that they will never, ever schedule a Ravens-Steelers or Patriots-Jets game in Week 17 because they save those juicy, money-making matchups for earlier in the year in case they want to bump them into prime-time. But having the Patriots play the Bills or Steelers play the Browns every Week 17 does not guarantee any better of a game than, say, Patriots-Broncos or Chiefs-Redskins (spoiler alert!). Save for the Chiefs in my schedule, who would hypothetically join a handful of teams since 2002 when the league realigned, hardly any teams ever play all of their divisional home or road games within their first three divisional matchups. The league has also been careful in the past to avoid having teams face a divisional opponent twice before it has faced another opponent at least once. It also rarely ever has teams playing twice within three weeks, as that only happened once (Lions-Bears in 2003) between 2002-2005. As I mentioned with the Texans above, anything involving a trip to Seattle has to be handled with care. Because it is so geographically inconvenient for most of Seattle’s non-divisional opponents, the league generally schedules trips to Seattle around home games, rather than as part of a two- or three-game roadtrip. Again, sorry, Houston! While I didn’t take into account any concerts or papal visits, I did honor the fact that eight teams — one-quarter of the league — are generally impacted by their baseball counterparts. The Ravens, Bengals, Chiefs, Lions, Raiders, Eagles, Steelers, and Seahawks all have to step aside when the Orioles, Reds, Royals, Tigers, Athletics, Phillies, Pirates, or Mariners are playing at home, since the MLB schedule comes out around September of the previous year. So I utilized the dates of those MLB teams and made sure that the counterpart NFL teams did not play at home during any conflicting dates, just as the head schedule-making honchos would. Also, I returned the league to the days when it was entirely respectful of not interfering with the World Series. Though the NFL would never allot an open evening for a potential Game 7, which used to be played on a Sunday night when the Fall Classic began on a Saturday, it always used to keep its Sunday night slot vacant for the first Sunday of the World Series. That would be Game 4 of the 2017 World Series on October 29. The Pro Bowl is back where it’s supposed to be — in Hawaii at Aloha Stadium, a week after the Super Bowl, when everyone can participate and the reigning Super Bowl champs can get their due respect from their peers during player introductions… If I had my druthers (sadly, I don’t), I would also bring back the original Super Bowl logos to inject the big game with some personality and originality. The monochromatic logos that must feature the Lombardi trophy smack of corporate soullessness… Another thing the league generally tried to avoid with prime-time games back in the day was having a team that was featured in three or four night games playing multiple games against teams from another conference. Occasionally teams would play multiple prime-time games against divisional opponents, but even that was unusual. One anomaly in my schedule that did not crop up from 2002-2005 was having a team play two games on MNF within three weeks, but the reason the Raiders earned that fate was my desire to keep the Rams and Chargers in separate time slots. The Raiders ended up with three prime-time games over a four-week span… I wanted to avoid having more than two weeks during the season of having both the Giants and Jets on the road (it occurs in my schedule in Weeks 4 and 15). In previous seasons (especially between 02-05) I never saw any more than two weeks where the two Meadowlands inhabitants were on the road. One of my final hurdles of making the schedule was ensuring that MetLife Stadium was not vacant in Week 16 or 17. Be the first to comment on "Unveiling the 2017 NFL Schedule — Kind of"